Entry | Shikoku Circuit Cycling | Enjoy food, tourism, and riding! Entry for this Project requires a payment of 13,000 Japanese yen (tax included), which covers the expenses the entrance fee for purchasing the challenge kit. * The entry fee for foreigners living in Japan is 8,000 Japanese yen. Please apply from this Japanese page. As part of the challenge kit all of those entering the project will be presented with an original Shikoku circuit cycling jersey and an official challenge pass that serves as an original stamp sheet, with 29 roadside stations in Shikoku serving as checkpoints. Please wear this cycling jersey and enjoy cycling around Shikoku. And please enjoy cycling even more while collecting the stamps. Those who enter the challenge and who complete a circuit of Shikoku within three years will receive a (free) present of a completion certificate and a buckle from the Ehime Cycling Life-style Promotion Association as a present for completing the Shikoku circuit. * The design is subject to change. Note 1) ¥13,000 (tax included) of the entry fee is allotted towards the expenses of purchasing the challenge kit. Note 2) The completion certificate and commemorative medal (buckle) will only be presented to those who can verify that they have completed the challenge. The issuing of the completion certificate and the production for the commemorative medal (buckle) will be performed for free since they are presents. These expenses are not included in the ¥13,000 (tax included) of the entry fee. 1) Enter the required information in the entry form below and click the enter button to enter. Confirm your entry with the Ehime Prefecture Cycling Project Secretariat. 2) After confirming your entry with the Ehime Prefecture Cycling Project Secretariat, we will give you the web address for payment. You may use PayPal or a credit card to pay. 3) Once payment has been confirmed you will receive a cycling jersey and an official challenge pass for your challenge kit from the Secretariat. 4) Those who complete the challenge within three years from the date of submission of the entry fee will be presented with a certificate of completion* and a buckle for their Shikoku circuit completion present. *In order to receive the completion certificate present you will need to provide proof of completion. A certificate of completion will only be issued once proof has been recognized. Please see the details below. *Approximately three to four weeks are required for the kit to arrive, but the time necessary for arrival will vary depending on the country and region. *Entries will only be accepted in English. In the event that you enter the CHALLENGE 1,000 km Project and attempt to cycle Shikoku, please enjoy your cycling with sufficient consideration for your safety. Your safety is your own responsibility. The Ehime Cycling Life-style Promotion Association, which sponsors the CHALLENGE 1,000 km Project, bears no responsibility whatsoever for accidents, incidents, or problems. 1) The design for the cycling jersey can be seen below. 2) There are five sizes (Japanese size)*: S, M, L, XL and XXL. Please enter your size on the entry form. *In Japan, the size is displayed as "S - XXL". However, as these sizes tend to be smaller than EU or US sizes, you need to be careful. Please check the size chart and compare the common size in Europe and the United States. If there is anything that you are unclear on, please contact the Ehime Prefecture Cycling Project Secretariat. The official challenge pass is an original stamp sheet with 29 roadside stations around Shikoku as checkpoints. An introduction will be provided below, this can be used as proof for the completion certificate. *Free challenge pass (not official) may not be used as proof for the completion certificate. The completion certificate is a premium commemorative article with your name, completion date, and photo, it also has a serial number assigned according to the completion order. You will need to provide proof of completion by one of the two following methods in order to have a completion certificate issued together with your Shikoku circuit completion present. For details, please see the materials sent with the challenge kit which will be shipped to you after payment of your entry fee. This requires that you collect stamps with the official challenge pass at a total of 15 or more roadside station stamp points, including three or more spots in Ehime Prefecture, three or more spots in Kagawa Prefecture, two or more spots in Tokushima Prefecture, and three or more spots in Kochi Prefecture (please get your stamps from at least three locations in each prefecture [two locations is okay for Tokushima Prefecture]). When you've finished collecting the stamps, take a picture of your official challenge pass with your smartphone and send it through the Official Challenge Pass Verification Site (In Progress). After reviewing your challenge pass with the Ehime Prefecture Cycling Project Secretariat, we will issue your completion certificate. Completion certificates will be issued within three years of the payment of the entry fee. Please send your cycling data recorded with a Garmin, Strava, or similar device (as a TCX file) to the site for GPS cycling computers. Verification of your completion requires that you have 500 km or more in your actual GPS data and that you pass through the four prefectures of Shikoku within three years of paying the entry fee. You may extract the TCX file using Garmin connect if you are using a Garmin GPS device or using specialized services or Strava’s services for other GPS devices (excluding some devices). For details, please see the usage guides for each device. For Strava, you can download the TCX file by adding /export_tcx to the end of the activity page web address. *Only those who send in a TCX file from a GPS device will be issued a cycling certificate displaying their actual cycled route. *It may not be possible to issue an accurate cycling certificate through the use of a TCX file due to file compatibility issues. Thank you for your understanding. *Depending on the submitted photo data, it may not be possible to display the photo on the completion certificate. Thank you for your understanding. After filling out the information below please click the Enter button. After confirming your entry, the Secretariat will contact you with detailed information. * In Japan, the size is displayed as "S - XXL". However, as these sizes tend to be smaller than EU or US sizes. Please be careful. * We’re running low on the cycle jersey. 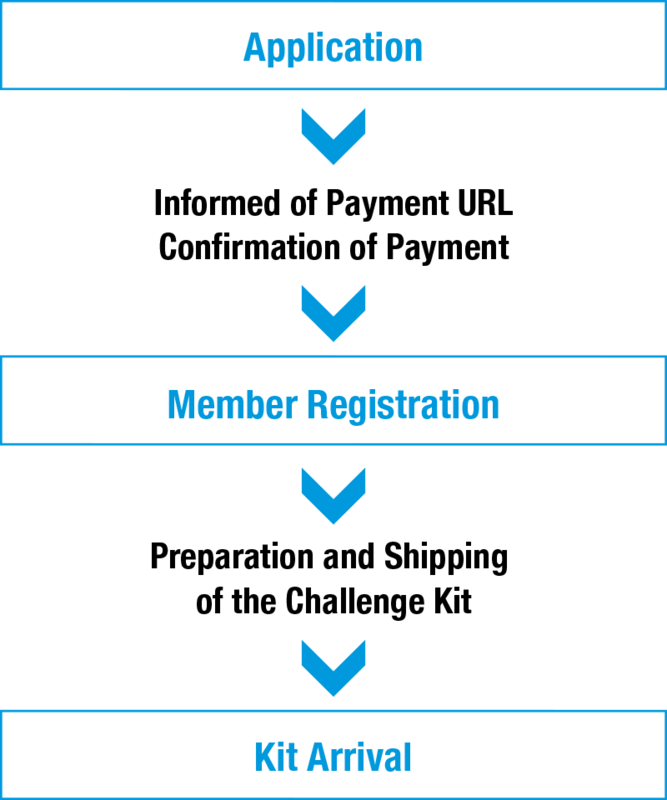 Please note the shipping of the challenge kit will be delayed for a while. The arrival is three or four weeks later after payment. We apologize for the inconvenience. Receive notifications from Ehime Prefecture. These terms apply to all relations between users and the Secretariat concerning the use of these services. Those who wish to enter the challenge must submit an entry application through the methods set forth by the Secretariat and their use entry will be completed via approval by the Secretariat. In the event that the Secretariat deems one of the following to apply to the entry applicant, the Secretariat may reject the entry and the Secretariat bears no responsibility to disclose the reason for rejection to approve the entry. Users will manage their user IDs and passwords for the service under their own responsibility. Users may not transfer or loan their user IDs or passwords to a third party in any situation. In the event that an individual logs in with a user ID and password combination that matches the entry information, the Secretariat will recognize that individual as being the user who originally submitted that user ID. The Secretariat will separately set forth compensation for the challenge kit and expenses for future Shikoku cycling cultural promotion and the user will pay the usage fees displayed on this website in accordance with the methods indicated by the Secretariat. When using these services users may not perform the following actions. The Secretariat may suspend or interrupt the provisioning of some or all of these services without prior notification to the user in the event that the Secretariat judges any of the following to apply. The Secretariat bears no responsibility whatsoever regardless of the reason for any losses or damages borne by the user or a third party as a result of suspension or interruption in the provisioning of these services. The Secretariat may restrict users’ usage either entirely or partially for these services or may delete the entries of users in the following situations without prior notification. The Secretariat bears no responsibility whatsoever for damages to the user arising from the actions of the Secretariat based on this article. The Secretariat will be exempt from responsibility for a default in the event that this is not due to the Secretariat's bad faith or gross negligence. Even if the Secretariat for some reason bears responsibility, the Secretariat will only bear compensatory responsibility within the scope of the cost for paid services and within the scope of damages normally arising. The Secretariat bears no responsibility whatsoever in disputes, communications, or transactions arising between users and other users or between third parties for these services. The Secretariat may suspend the provisioning of these services or change the details of these services without notifying users and the Secretariat bears no responsibility whatsoever for damages to users arising as a result of this. The Secretariat may change these terms at any time without notifying users in the event that the Secretariat deems it necessary to do so. Notifications or communications between users and the Secretariat will be performed through the methods set forth by the Secretariat. Users may not transfer their rights or duties or provide them as security based on these terms or based on their status in the use contract to a third-party without the prior approval in writing of the Secretariat. Interpretation of these terms as well as the use of this website shall be governed by the laws of Japan. In the event that a dispute arises over these services or this website the Matsuyama District Court shall have exclusive jurisdiction. ･ The effective period for the Shikoku circuit achievement present is within three years of the submission of the entry fee, but please understand beforehand that the present may be suspended or discontinued and the details may be changed without notice. 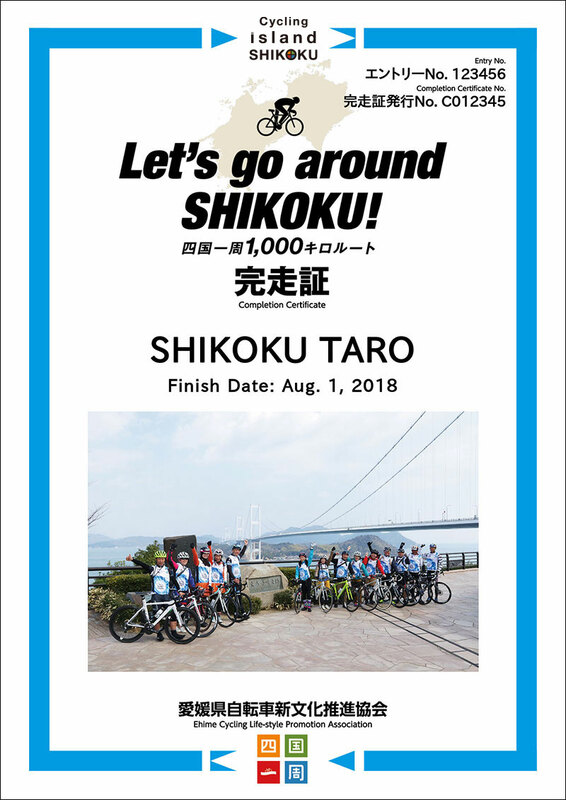 ･ When applying for the Shikoku circuit achievement present if the application is made by providing proof of completion through the use of a GPS cycling computer, we will confirm your digital cycling certificate on this website using the same system. Please understand beforehand that, depending on the device used and the compatibility of the TCX file sent, there may be instances where a digital cycling certificate will not be possible. ･ Please understand beforehand that the services of this website may not work and there may be display issues on some devices, operating systems, and browsers. ･ Please click agree after reading the cautionary points for use for this website.